The absolute best scent in the world. I've worn hadrien forever. People ask me all the time "what are you wearing"
I wanted to love this as I love bergamot. I do use myself in it and it fades quickly as citrus does. The dry down is hard to detect. It’s lovely but does not last. 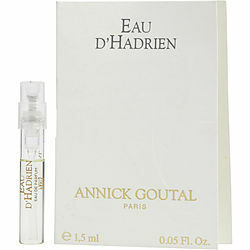 I ordered a sample of Eau d'Hadrien by Annick Goutal and I love it! The top note smells just like a fresh orange blossom then later it's like I just showered with an expensive perfumed soap, clean and fresh. Will order it again. Just received my sample. I think this is a fun fragrance to try if you like more natural citrusy/woodsy (but more modern and not masculine).fragrances. It is similar to some other Annick Goutal fragrances I've sampled. I feel it is worth getting a sample to try for yourself. It is a little different than many out there. I am interested in trying some of her other fragrances. Still looking for my signature fragrance though...glad I found this site!